Surveillance cameras help to bring safety and security to areas where law enforcement and security personnel are not normally able to patrol. 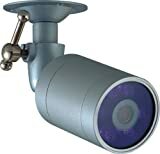 The SPECO CVC-627 Waterproof Color Bullet Day/Night Camera with IR LEDs is great for any outdoor application. Constructed of durable waterproof aluminum, this camera comes with a removable sunshade that helps eliminate glare and can even operate fully submerged in water. Designed to provide a high-resolution picture even in low-light and no-light conditions, the SPECO CVC-627 is a great addition to any video surveillance system, especially in round-the-clock applications subject to inclement weather conditions. 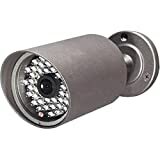 This bullet camera utilizes a 0.25-inch color CCD (charge-coupled device) image sensor with a 3.6-millimeter fixed lens, and provides 510-by-492 effective pixels. The CVC-627 has a high resolution of 420 horizontal TVL (TV lines), and achieves a S/N (signal-to-noise) ratio of 48 dB or better. Already extremely sensitive to light with a minimum illumination of 0.01 Lux to infinity, this camera has 12 built-in IR (InfraRed) LEDs (light emitting diodes) that allow it to receive a picture in total darkness (0 Lux) up to 45 feet away, as well as a CDS sensor that turns the IR illuminators on automatically when it gets dark. The SPECO CVC-627 operates on the NTSC TV scanning system, and includes a standard BNC (Bayonet Neill-Concelman) video output. This unit runs on 12-volts DC power and can operate in temperatures ranging from -14 to 120 degrees Fahrenheit. The CVC-627 comes complete with automatic gain control and back-light compensation, and a built-in automatic electronic shutter with speeds ranging from 1/60 to 1/100,000 of a second. The SPECO CVC-960IR Weatherproof Color Bullet Camera with IR LEDs is great for any application in which extremely low-light conditions may at times prevail. This camera comes with 48 IR (infrared) LEDs (light-emitting diode) built in, and automatically switches from color to B/W (black-and-white) for nighttime viewing. Designed to provide a high-resolution picture even in the lowest-light conditions, the SPECO CVC-960IR is a great addition to any video surveillance system, especially in round-the-clock applications subject to inclement weather conditions. 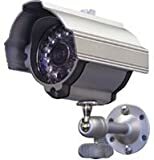 Securely set into a weatherproof housing, the CVC-960IR bullet camera utilizes a 0.25-inch color CCD (charge-coupled device) image sensor with a 3.6-millimeter auto-iris lens, and achieves a high resolution of 350 horizontal TVL (TV lines). Already very sensitive to light with a minimum illumination of one Lux in color to infinity, this camera’s 48 IR LEDs operate on a 840 NM (nanometer) wavelength and allow it to receive a picture in total darkness (0 Lux) in B/W up to 60 feet away. The SPECO CVC-960IR includes a fan that automatically turns on when IR LEDs are in operation, and runs on a regulated 12-volt DC power supply. The CVC-960IR comes complete with automatic white balance and backlight compensation, and a built-in automatic electronic shutter with speeds ranging from 1/60 to 1/100,000 of a second. Illumination: 0 Lux with IR upto 10 Ft.
Illumination: 0 lux with IR up to 10 ft. The Sylvania B&W Video System is ideal for protecting your office or business. The system is easily mounted on a wall or ceiling and the wireless capability lets you set it up without the hassle of long cords. Listen-in audio lets you hear what is going on as you watch.